Toronto firefighters were on the scene of this two-alarm fire in an empty building at the corner of Gerrard Street East and William Hancox Avenue Monday night. No one was injured in the fire, which is considered suspicious and is under investigation by Toronto police. Photo by Melinda Drake. In the insert photo, taken by Jennifer Jones, flames can be seen coming from the building. 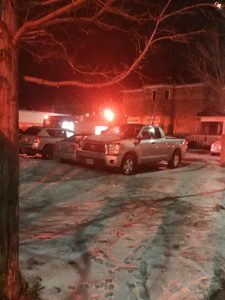 Toronto police are investigating a “suspicious” fire which caused considerable damage to an uninhabited building on Gerrard Street East just east of Hannaford Street on Monday night. 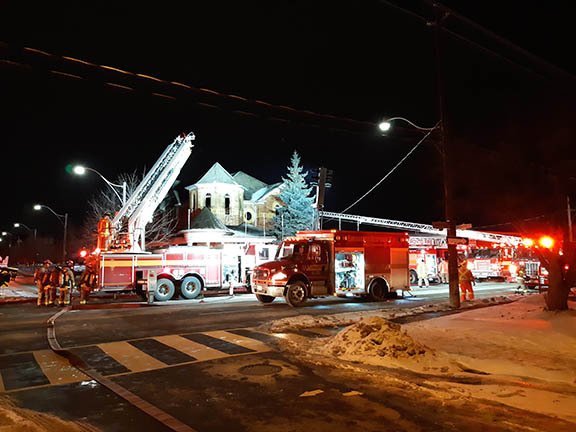 The fire at 2336 Gerrard St. E., on the northeast corner of William Hancox Avenue, was called into Toronto Fire Services at approximately 9:25 p.m. on Feb. 11. When firefighters arrived the fire was active with visible flames and a defensive position was taken to battle the blaze. The two-alarm incident saw firefighters attack the fire from the outside and then work their way inside to extinguish it fully. The building is not inhabited and was once used as a sales centre for the homes in the Upper Beach Estates north of Gerrard Street. Firefighters had to break through some boarded up windows to make their way inside the building. Toronto police said there are witness reports of three males leaving the building and getting into a car shortly before flames became visible, and the fire is under investigation. Toronto Fire Services investigators are on the scene today to determine the cause of the fire. Toronto police canvassed the area last night, and the investigation continues.